Loaded with pertinent references and web pages - a must read to understand what is at risk. Beth Harrison's short book will ramp you up on the hows and why of behind the scenes GE shenanigans, the book is particularly suited for those with info overload. There is no excuse now for all not to ramp up on this most pressing subject! You can listen to a short (13 minute) Interview with Beth here. "Overall, U.S. regulatory agencies policies* state that: no public records need to be kept on farms growing GE crops; companies that buy from farmers and sell to food manufacturers and grocery chains do not need to keep GE crops separate from traditional crops (therefore purchasers have no way to avoid buying GE foods); and labeling of any seeds, crops, or any food products with information about their GE origins is not required. As a result of these policies, American consumers have no way to exercise informed choices in the grocery store." *Most are not aware that many governmental regulatory bodies such as the FDA, USDA, CDC etc. are actually initiated and heavily supported by the industry. The Therapeutic Goods Administration (TGA) Australia's regulatory agency for medical drugs and devices for instance, are outright funded by the industry. They are essentially public relations and diversionary arrangements to control and placate the masses. Contrary to perceptions, regulatory bodies are essential to protect the industry, consumer protection is incidental! Regulations favourable to industry are created in the name of health and safety such as testing their wares on animals etc. which often have no relations to human health and safety. Once passed the companies are then off the hook, the tax payer and the injured party/s are left holding the bag for subsequent problems and/or complications.... Agencies themselves, by design of course, are unaccountable and serve as a shield for the industry. From time to time tidbits of real, often benign, consumer protections are thrown in to keep the perceptions alive. Occasionally a genuine protection gets through the cracks, due to the odd whistle blower and/or employee fiduciary duty actions such as the Delaney Clause mentioned below. In fact these agencies like most "activist/health/environmental/industry associations and institutes, in whole or part, are often funded and/or run by corporations with vested interests - this is the most effective public relations tactic money can buy!" An interesting aspect is the contrast between the EU (where there are labeling laws and the dangers of GE foods are well known) and North America (where the corporate controlled media has kept the public in the dark). The accomplices are the government, research and educational institutions, food and medical cabals, who serve as servants of the industry. "To provide a one-sided image of GE food as necessary and beneficial, propaganda in America has been disseminated via biotech front groups, government and industry-sponsored video news releases on television, audio news releases on the radio, Web sites, as well as government and industry-sponsored children's biotech "education." At the same time, multi-million dollar anti-labeling campaigns and preemption laws have been passed to prevent local governments from banning GE food." They clearly engage in the deliberate obfuscation, destruction and/or prevention of access to the adverse reactions data. As with vaccines and drug adverse reactions, data is often not reported or not taken at all and what data is collected is often sloppily complied, skewed, and/or kept secret. This incredible, snow job is done primarily, in this case, by out right lies mostly promulgated by our tax dollars; preventing the labeling of GE foods thus impairing data collection; mixing and infecting non GE with GE foods; selective data reporting and/or not collecting the data at all; fraudulent and self serving studies; deflecting injury to other causes; on and on. When sued, they force secrecy as part of the settlement so they can continue the shell game. If that gets too much than we have the vaccine and Nuclear Industries' Indemnity Acts. "Shedding Light on Genetically Engineered Food" provides solid support for these allegations. "It is easy to see how unsuspecting consumers in America have been kept in the dark about GE food and why the biotech industry has grown significantly, even though evidence or scientific consensus that GE food is safe for human consumption has never been established**. Americans are risking their health in return for non-existent and largely unproven consumer benefits; yet U.S. taxpayers unknowingly prop up the biotech industry and multinational corporate profits by massively funding GE crop and dairy subsidies, state initiatives, tax breaks, foreign aid, and other biotech support doled out by the U.S. government." ...."Monsanto's former public relations chief, appointed to Clinton's Committee of Scientific Advisors and Gore's Sustainable Development Roundtable, groups that recommended the Delaney Clause (which said that a known carcinogen cannot be added to food) should be replaced with more "flexible" legislation. Since December 2002, Foreman has been on DuPont's Biotechnology Advisory Panel." ..."state legislators who support the biotech industry and food manufacturers have taken away the rights of cities and counties to ban GE crops. Some, fifteen states have passed preemption laws, or what have also been called Monsanto Laws." In the past, state governments have overseen policies related to public health, safety, and welfare; yet no state regulates GE crops and livestock in a manner that protects public health and the environment. Biotech corporations have increasingly been trying to stop debate by eliminating local regulation of GE crops." To eliminate public input, existing rules and regulations are continually being relaxed and/or ignored. The book clearly demonstrates how the industry in collusion with the government introduces untested products for consumption. When problems arise they are deflected on the consumer to prove harm, instead of the rightful onus on industry to prove safety of their products.This clever tactic has essentially defrocked the consumer. Who essentially is defenceless and forced to become the industry guinea pig as little remedial or future preventative action can be made. Yet again a tacit example, as if more were needed, showing how the government essentially protects the industry by turning upside down the rules ported to protect the consumer. Corporations in partnership with the governments consider us as fodder for their needs. To most this should be inconceivable but not to the industry shills, better known as useful idiots, described in detail in the book, including names and all. Shown clearly is how the industry and government all rolled into one uses hardball tactics, revolving door policies, along with incestuous tax dependencies to enforce control over the unsuspecting consumers. Much like the Pharma cartel's at the turn of the 20th century whence all funding was directed towards drug based solutions in order to squelch competition. Here again we see how the funds are only directed to biotech sector farms, education and research. Public acceptance via false education, research, media and marketing are all part of the biotech funding aimed to eliminate competition. Competition from far more healthy, cost effective, safe, and efficacious traditional farms. The biotech sector has not missed a trick, and there are some surprising ones discussed in the book, to fool the unsuspecting. This is organized crime at its best! One can now see why a handful of elites should like to use these strong arm tactics and cunning strategies, outlined, so clearly in the book, all over the world. There of course could be nothing better to make their lives easier. Thus, the impetus to create a one world government. Taxpayer money funded of course! We must resist: "Resistance creates time to awaken populations to the planned disaster!" The beauty of information is that once it is out - people can learn the facts and they can deal with the horror story and change their outrage to action. 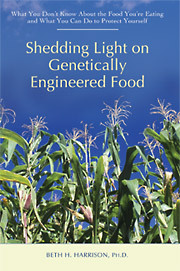 "Shedding Light on Genetically Engineered Food" fits this Need. A worthy handbook for action. I support the bill. Who in their right mind would support a stupid consept of GM . Thank you Beth. It seems that we will need a people's revolution. The government has been thoroughly infiltrated from top to bottom with new world order promoters and biotech, big pharma, big agri insiders/apologists, and is non-responsive to our legitimate concerns.